An estimated 23,400 women will be diagnosed with breast cancer and 5,100 will die of it. An estimated 190 men will be diagnosed with breast cancer and 55 will die of it. On average, 64 Canadian women will be diagnosed with breast cancer every day. On average, 14 Canadian women will die of breast cancer every day. One in 9 women is expected to develop breast cancer during their lifetime and one in 29 will die of it. Breast cancer incidence rose steadily from 1980 to the early 1990s, partly because of increased mammography screening. Breast cancer death rates have declined in every age group since at least the mid 1980s. I am putting out a call to one and all to dig deep into their wallets and purses and to help me spread the word far and wide! As many of you know, my father has had a beard for probably as long as you have known him. In fact it has been 30 years he has had that same beard! I do not remember ever seeing his chin. After a lot of convincing, I have worn him down. 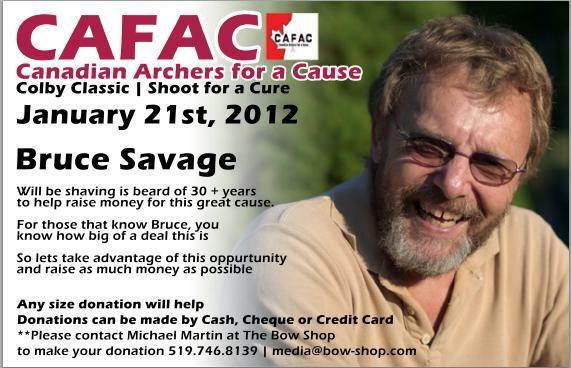 He will be donating his chin this year to the annual Canadian Archers For A Cause – Shoot For A Cure held annually at the Bow Shop in Waterloo. Last year alone, this tournament raised over $9,000 all sent to breast cancer research. This year we are hoping to do even better. Check out the web page for tournament information as well instructions on how to donate. This year the shoot will be held on January 21st at The Bow Shop in Waterloo. As I’m sure you can imagine, Dad is pretty attached to his beard and I’m hoping to make his beard a worthwhile incentive for donations to a great cause from across Canada. I am asking for not only your donations, but I would like all of you to help me get the word out far and wide. Please post this information on provincial and club web pages where possible, email to friends and family, contribute personally. There is not a lot of time for us to pull all of this together as the shoot is being held January 21, 2011 but I REALLY appreciate any assistance you can give. Not only are we shaving his beard, we are planning on shaving it in the middle of the range as part of the weekend event. Of course this will be well documented via photos and will be dispersed for entertainment value after the shoot. What else would a good daughter do?! Donations can be made by contacting Michael Martin at The Bow Shop at (519) 746-8139 or via email at media@bow-shop.com . Any size donation is greatly appreciated and can be made via cash, cheque, or credit card. If you have any questions or would like more information please do not hesitate to contact me. Sorry if you receive this information more than once as I’m trying to get the word out quickly due to our short time lines. If you are planning to be in the Waterloo area for the weekend of January 21st, please consider participating in the annual Shoot of the Cure, however if not consider donating a couple of dollars to this worthy fundraiser.